15 days ago, I felt completely and totally overwhelmed. My husband and I had just navigated a very fast move into our new home, which is nearly 3x the size of my former condo in which we’d somehow managed to cohabitate, my immediate family had just had a therapy session in which we deliberately talked about the elephant in our familial room for the first time, and I felt so off kilter I could hardly breathe. I had to do something for me, and for months I had been wanting to juice. Actually, I’d promised myself that once we were in a real house, I would get a juicer. And, in somewhat typical form, I had not yet done it. Just like the water structuring device that I’d purchased to purify all the water on our property that was still sitting in a box, not yet installed to provide us with amazing structured water, there was no juicer. No way for me to make fresh vegetable and fruit juices, which I both needed and wanted to do. So I grabbed my 20% off coupon for Bed, Bath and Beyond, and off I went to buy myself a juicer! I was going to get myself the cheapest one there… after all, we’d just bought a house, and a washing machine, a dryer, a dishwasher, and countless smaller things. But the gods of BB&B had my back – Breville, the brand I had planned on purchasing, was excluded! That teeny tiny fine print had a long list of brands and items that did not qualify for the coupon. But Omega, the slow masticating juicer that I had read about and thought longingly of, was not on the exclusion list. So it was that I bought the exact juicer that I had longed for but was not going to allow myself the pleasure of having. Saving $60, a 15 year warranty and other potentially useful functions (i.e. making baby food, nut milks, nut butters?) Winning formula!!!! 14 days ago, I woke up in the morning and made fresh celery juice. My husband, always a good sport for experiments, joined me on the juice in the morning train. For several days, the first thing I did was get out and assemble my juicer, rinse two heads of celery, and run them through my Omega. Then I’d take it all apart, rinse the pieces, and put them in the drying rack, to be ready for the next morning’s juicing. That feeling that I had, pre-celery juice? Complete overwhelm? For the most part, it’s still there. So phase 2 begins: I will grow my own celery! No rose-colored glasses here…. I know that the amount of celery we go through cannot reasonably be grown in my living room window, but a few days worth every few weeks? That has to be possible. And thus it begins: 10 little baby celeries growing from the roots of their long gone and digested family, sitting in the sunlight in their little glass containers filled with water. Note that these glass containers mean that we now have almost no small containers for leftovers – something of a hardship for people who cook as much as we do in general, but particularly now that we are on a liver cleanse and eat almost exclusively from home. For the first few days, my baby celery plants who began after I cut their stalks off for juicing didn’t look like much at all. The only celery plant that I’d somewhat brutally broken off stalks from, that celery baby started looking like it was growing with a day or two, but all the others seemed to be struggling to poke their green heads up out of their safe spaces. I understood them. They looked how I felt. Daily, I would inspect my baby celery plants, top off their water, wonder if I should move them to a different location. Inevitably I decided that they were fine where they were, that they’d come out when the time was right, and that it would all be all right in the end. And you know what? They did come out! Their teeny little yellowy fern-y looking heads peeked up, then they started to green up, and now I have a miniature forest of celery that needs to be planted into dirt. And I’m avoiding it. Somehow it feels like they betrayed me. All the hours I would spend gazing at them, admiring their beauty, trying to get a photo to adequately capture it on my phone, giving them just a teeny bit more water, that was all done and then those little twerps did exactly what they were supposed to do – grow! Which means what, that I need to accept and enjoy the fact that I too have the perfect ingredients to grow, and allow my ferny bright green leaves to reach out to the sun? It kind of feels like my celery babies are judging me. Like I need to grow as much and as fast as they are. And maybe I am not up to it. My resources might be so low that there is very little leftover to put towards growth. Those first few days of my cut off celery roots, the days where there seemed to be no growth evident? That’s how I am feeling right now. It feels like clinging to the stillness in the eye of the hurricane. If I take my eyes off my celery, there are so many things to do and situations to cope with and people’s emotions that I can’t not see and the stories behind them and on and on. But if I focus my gaze in on the tiny green fern-y looking leaves of my celery babies, and admire their bold greenness, and think about how I will plant them and arrange them in my sunny southern exposure living room window, that is all I can see. The usage of resources to push upward towards the light, the courage of pushing through the dark safety of what has ended. Somehow, gazing at celery restores me, one moment at a time. These words, the statement that “my joy is based on my adherence to truth,” is from the final track on East Forest’s album The Education of the Individual Soul. Since I began listening to this album, these nine words have rolled around in my head. What does it mean? Adhering, or not adhering to truth… what is that in real world terms? I think of myself as an honest person, but is this lyric really about the dichotomy of honesty and dishonesty? What is the real truth? The more I sit with it, particularly in this season of my life where pieces are falling into place, the more I realize that for me, adherence to truth is 100% an inside job of self-acceptance and empowerment. My truth, my Sat Nam, is based entirely on me taking responsibility for myself and owning my personal power, not holding on to anything that is not mine to hold. If you are following this series, you may remember that in the summer of 2016 I upended my life (for a catch up or refresher, click here) and ended up eventually relocating to my hometown of Missoula, Montana. During that summer, when I felt like a shadow of myself, knowing that I needed to reclaim my truth, I took myself totally out of my known world before returning home. For just over 40 days, I was a sevadar (volunteer) at Chateau Anand, an amazing place near Poitiers, France. Going all the way to France to reclaim myself may have seemed extreme to people who cared about me, but I followed my inner knowing to that pink castle, certain that I would fast track my self-reclaiming process. How did I know that would happen? Daily practice! My days at the Chateau were always a combination of sadhana, work and time by the river. I would wander down to the river to pray, read, journal, meditate, and just let myself be at least once per day, by myself or with friends. More often than not tears would come. 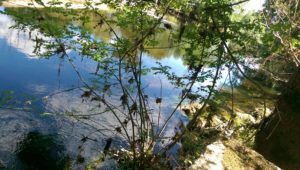 Feeling as frayed as I had been for years, having virtually nonexistent resources to keep me steady besides my daily practice, I would sit on the metal footbridge and stare at the water. On one side of the bridge, it was calm (as pictured below) – and on the other it was a crashing waterfall, chaotic and in perpetual motion. My perspective dictated what I saw, which was exactly the reminder I needed. Don’t get me wrong, this was not a magic pill to solve every challenge I was coping with at the time. This is an ongoing practice – my time at Chateau Anand was amazing and exactly what I needed that summer of 2016, but like all watershed events it did pass by. So to keep myself clear, and keep only my monkeys in my own personal circus, I continue to practice every day. Starting the day on my sheepskin, moving and breathing and chanting, brings me back to my true self. That, to me, is what clarity is all about. Note: if you are in the Missoula area and want to increase the clarity in your life, check out this class that is beginning at Red Willow in August. And if you want a laugh, regardless of where you are, watch this 2 minute video we made about it! Wow, what a summer. It has felt, more often than not, that every time I looked to the outside world there was chaos and trauma in every direction. Honestly, I did not know what to do with it all! The feeling of overwhelm was in charge of my life for a few weeks. I let go of my morning meditation practice, stopped playing my musical instruments, wasn’t singing, barely got in a little hiking… in short, all of the tools that connect me to myself were thrown aside. After all, what was the point of taking care of myself when life felt like a hurricane? I was struggling. Emotions were ruling my mental state. I felt overreactive to news about absolutely everything in the world that I cared about (which, of course, is infintely more than I have any ability to directly impact or control,) and I was so depleted that I told myself I was stuck in this space. But was I? In the summer, my beloved mother spends hours at a time weeding her gardens. She carefully removes bindweed and quackgrass, creating room for vegetables and fruits to have optimum nutrients, light, and air. I would spend hours weeding with her as a child. She taught me that gardens grow best when the weeds are kept under control – if you want to have fresh strawberries, you have to make sure they have space and water. In my internal garden, I had generally been keeping up on my weeding , but when overwhelm took over, there was no room left. All the light and air was gone, and I was in a rough spot. Luckily, I have a great support system, and one of my mentors spoke up and reminded me that I need to do my work. Chop wood, carry water, pull out those pesky weeds. So last week, I took my garden back! I began to wake early every day, to have quiet time for yoga & meditation so I could connect to my higher self before heading out for my day. I got myself outside more days than not. I sang my heart out every day, played the piano, worked on some original compositions, and almost immediately I was back to myself. Coming home to myself, tending to my own internal garden every single day – that work is the most important thing I can do in a day. When I’m centered, connected to my higher self and in touch with my guides, work and life flow with ease. If you can relate to this experience, consider joining me for Growth Essentials: Sound & Meditation. Beginning on Monday, July 9, we will spend 90 minutes a week focusing in on clearing out those weeds in our gardens! 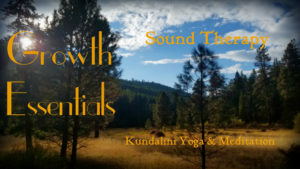 Using yogic tools and sound to support us, we will create space in our lives so that we can flourish in this season of growth. Tend to your garden, you magnificent human being. The best thing we can do in these times is care for ourselves so that our actions can have the maximum impact. It all starts at home.